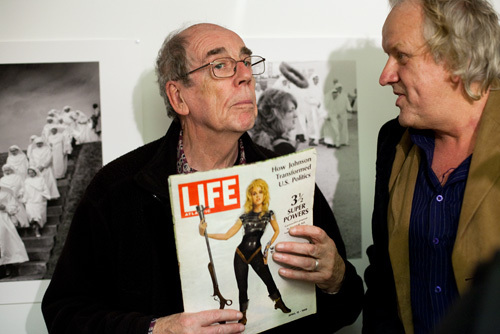 An exhibition by Magnum photographer David Hurn is currently running at Third Floor Gallery in Cardiff, with a talk underway this evening. David decided a clever way to showcase the breadth of his work spanning 55 years, would be to exhibit his photographs in pairs – with one picture shot during the first half of his career and another from the second half. A significant part of the exhibition Passing Time has been curated by the public, which I participated in, and selected pairings of David’s work will show at the gallery until 9th January 2011. Passing Time follows the premise of finding visual matches, resemblances or echoes between the first and second half of David Hurn’s career. This might sound like an easy task, but it is rather daunting. His archives span 55 years of photography in all the imaginable roles that a photographer might have, from documenting revolutions in the 1950’s to capturing on film the changing landscape and people of Wales before the turn of the millennium. That’s without counting his observations of daily life or the shoots that would create the movie posters for James Bond that have stuck in my head since I grew up. How on earth could the three of us running the gallery have a serious go at working on a project of such a large scale and with so many pitfalls? Well, we just gave up and handed the task to hundreds of contributors. This was not a publicity gimmick, but a serious solution to a problem: in a massive archive, a hundred pairs of eyes will find more than half a dozen. Last week we finally put the call for curators online. We chose a popular and surprisingly serious flickr forum to start a simple thread in which people could upload pairs of images. The system was very simple: search Magnum archives for David Hurn’s photographs and post a pair in which one image has been taken before 1982 and the other after 1982. Daylight Magazine has produced an excellent video interview with David about Passing Time, where he discusses some of the pairs submitted by the public. (He also discusses two of my submissions in the video from 6:00-8:55!) Pairs were selected from 21 contributors.